So for the past two weeks running I have been the Fantasy Football office league loser (Calvin Johnson NEVER get hurt again please). The punishment: bring in delicious treats for the office to enjoy. Much to my chagrin, I had to get creative after buying Dunkin Donut’s Boston Cremes was deemed unacceptable. I knew I wanted to do something pumpkin-inspired, and after some casual Pinteresting I found this recipe that not only includes S’MORES but requires DOUBLE THE COOKIE. What’s not to love, and how good do these bad boys look?! Basically, buy a pack of cookie dough of your choosing. I bought Nestle’s Pumpkin Break n Bakes for easy assembly. Then buy Honey graham crackers, small marshmellows, and chocolate also of your choosing. You could go with the classic Hershey’s, or the Godiva Sea Salt dark chocolate because I’m literally obsessed. Directions: Take one cookie and flatten to palm size. Break off a small piece of graham cracker (one that will fit in the middle of the flatten cookie), then place equally-sized piece of chocolate and top with marshmellow. 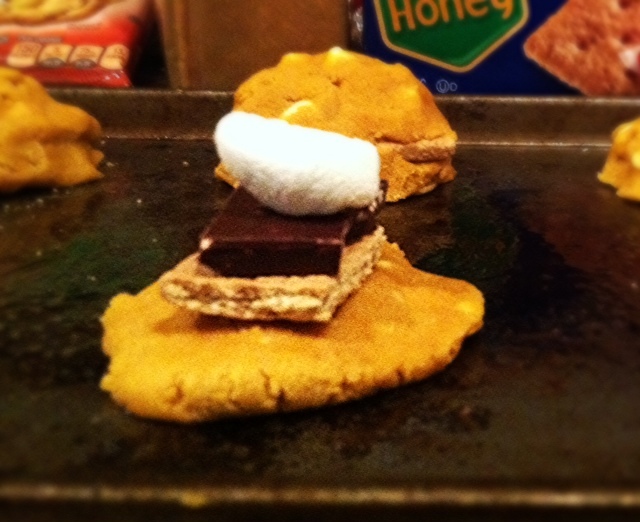 Flatten a second cookie, place on top of s’more, and mold so that the bottom and top cookies entirely envelop the s’more. 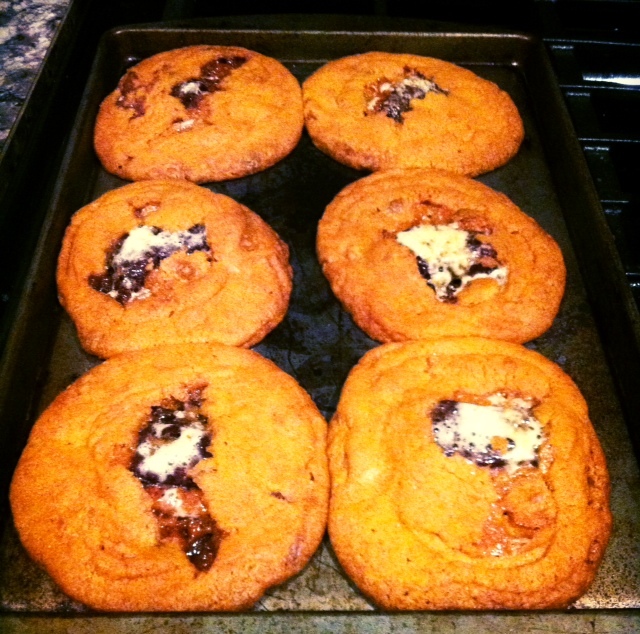 Place cookies on a Pam-covered baking sheet with plenty of room- as you can see they grow to be quite massive. Bake for roughly 17 minutes and check. S’mores will peek through a bit but don’t panic! I recommend taking out when they are still a tad mushy, as the melted mellow will harden when they cool. Add your favorite ice cream and EAT WHILE WARM AND GOOEY!!! Oh and these were an office hit. FINALLY a win!